Natural-looking, customisable, streak-free self-tan with anti-ageing benefits. Sounding too good to be true? Simply mix a few drops of this self-tanning elixir into your favourite skin care product to swiftly revitalise even the most pallid, lacklustre complexions. Your complexion will exude an enviable (realistic) sunkissed glow that lasts. 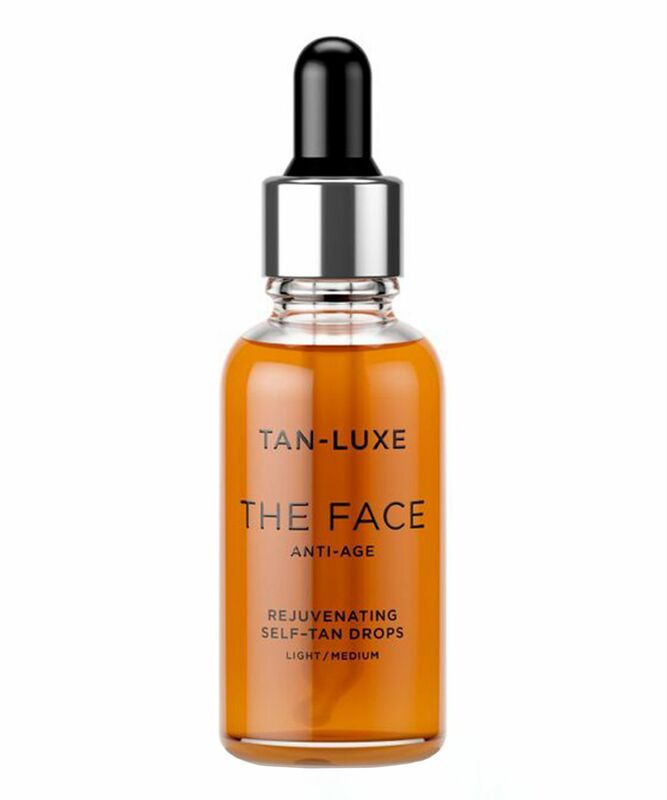 Meet your moisturiser’s new best friend: THE FACE Anti Age by TAN-LUXE. Just a few drops added to any point in your existing skin care regime will take lifeless, lacklustre complexions to the beach and back, imparting an effortless, youthful and natural-looking glow. Enriched with raspberry seed oil, vitamin E and aloe vera, every droplet of this miracle formula bronzes, boosts and fortifies skin’s fabric. For additional anti-ageing benefits, it’s super-charged with a tri-collagen booster to keep skin plump and supple while enhancing elasticity. A million miles away from the tell-tale ‘tangoed’ look of so many traditional fake tans, THE FACE Anti Age comes in two shades – ‘Light to Medium’ and ‘Medium to Dark’. Like a sun-drenched holiday in a bottle (without any of the skin-damaging rays), it delivers even, luminous colour that can be customised by adding extra drops to your chosen skin care product. No smell. No streaks. No drama. Just glow and go. Cleanse face thoroughly before application. Mix 1-4 drops with your usual moisturiser, serum or face oil in the palm of your hand. More drops will add depth of colour. Thoroughly wash hands after use. Gently exfoliate skin regularly to maintain an even, luminous glow. We advise a patch test is done 24 hours prior to use. Do not apply on broken, irritated or sensitive skin. Avoid contact with eyes. If a reaction occurs, discontinue use immediately and seek medical advice. Does not contain sunscreen and will not protect against sun exposure. Product colour may vary due to natural ingredients.